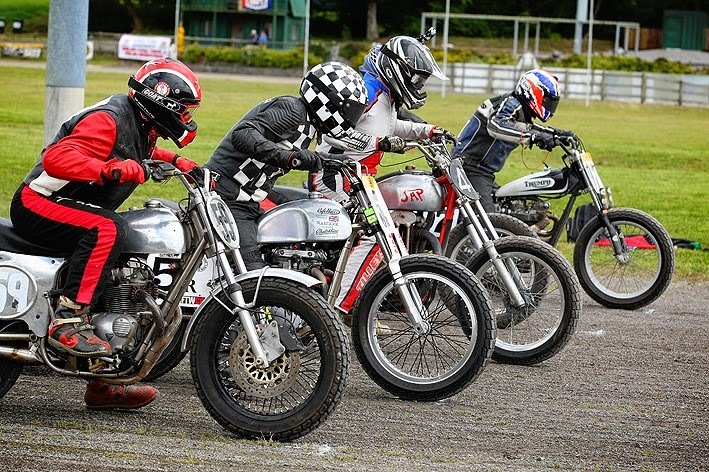 Last weekend the DTRA headed out to South Wales to race the half-mile trotting track at Ammanford. With the tail of Hurricane Bertha threatening it was touch and go, but we just about got away with it. 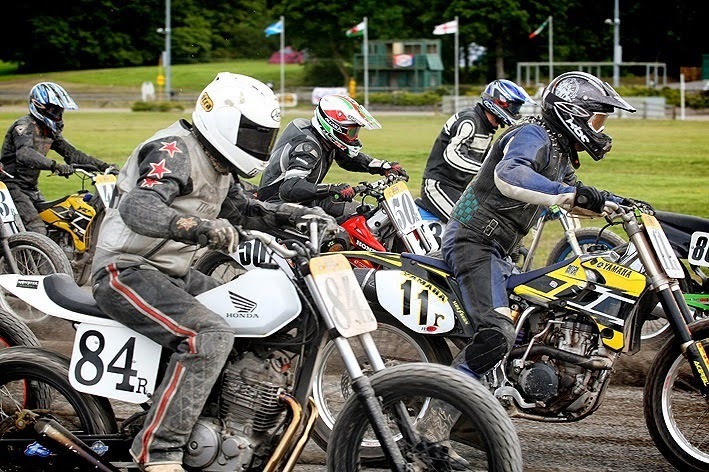 Guto Llewelyn, (camera on his helmet) who has raced with the DTRA on and off for years, entered his first race of 2014 on a borrowed Co-Built Rotax. 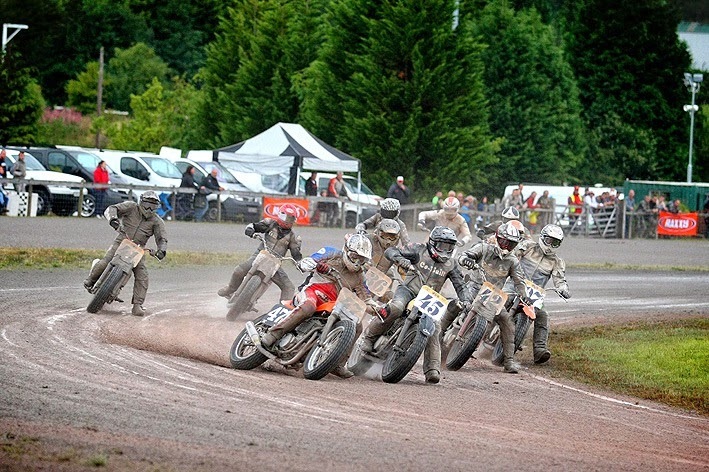 A very exprienced grasstracker, the rough, long track suited his style and he won the Thunderbike final. Classy. In the morning the dust was a problem. Then, after two very heavy showers, mud and spray made it difficult for anyone who wasn't in the lead (or didn't have a front mudguard). Juniors head out on the big track. Restricted grid. 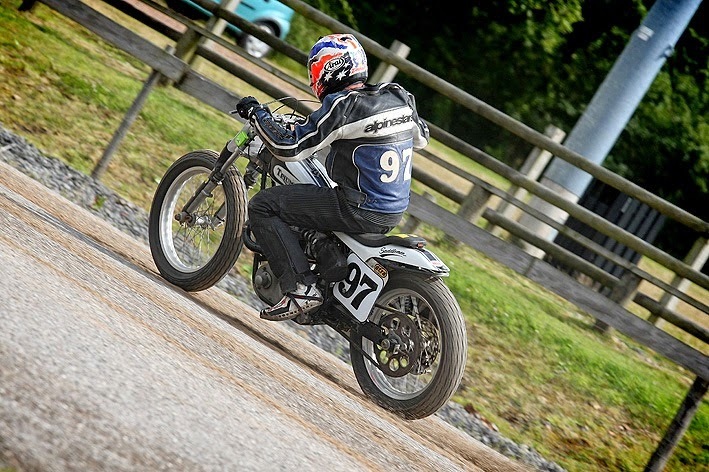 Stu, 84R, made a comeback on a Honda SLR650-based new build. Guy Sutherland on his recently imported Triumph. It's a replica of a Redline frame, made by VMC Racing frames. The engine is a T120 taken out to 750. When this bike is properly sorted it'll fly. 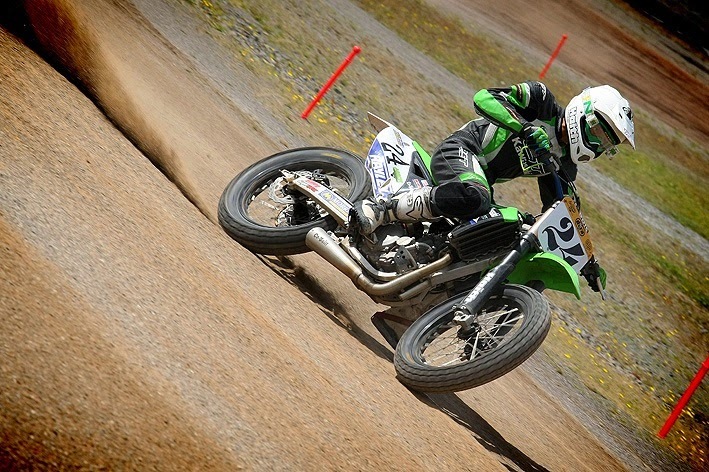 Kawasaki UK-supported rider, Ollie Brindley. Love the Co-Built low-pipe on this 450. 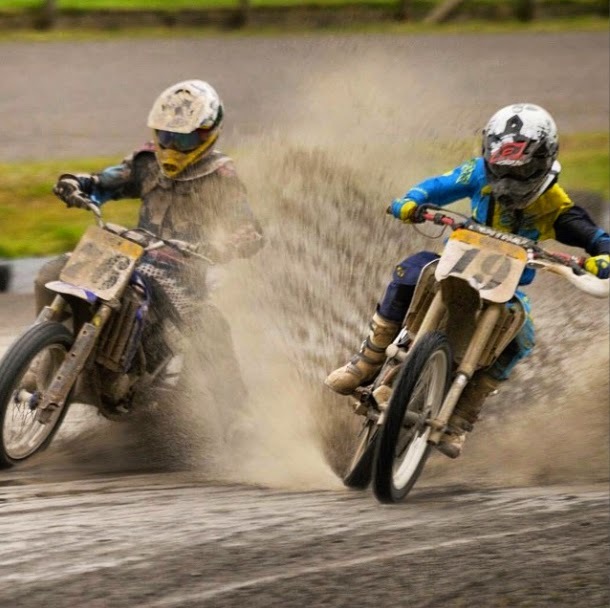 This was when the track was dry. 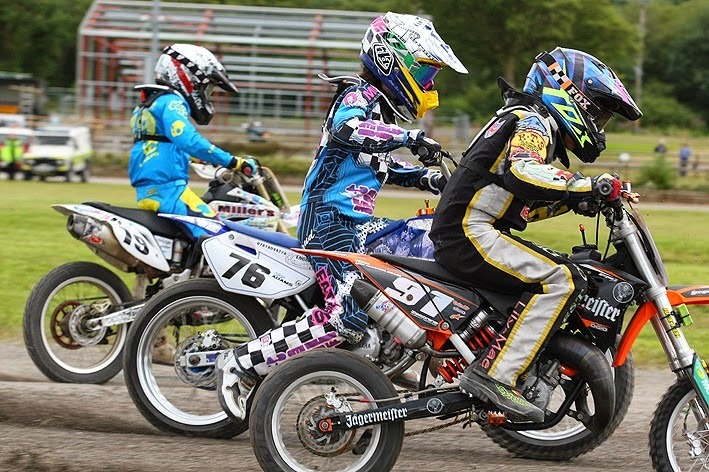 And this is a few hours later... #76 is The DTRA's only girl junior Skye Adams (though we have a lady rider in the Restricted class, Leah Tokelove). #17 is Jordan Lee Miller. Vintage class grid. The JAP-powered Ariel, ridden by Guto Llewelyn, didn't last the day unfortunately. 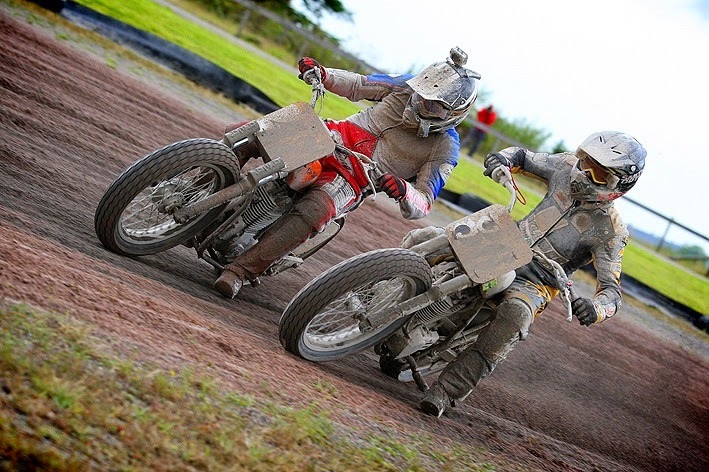 The final was won by Frank Chatokhine (chequered helmet - read about this Metisse T100 in Sideburn 17). Second was Guy Sutherland on his Triumph framer. Nick Ashley was third on the Cheney Triumph. John Boddy turned up on an ironhead Sportster, obscured in this shot, but it never got quite up to speed. 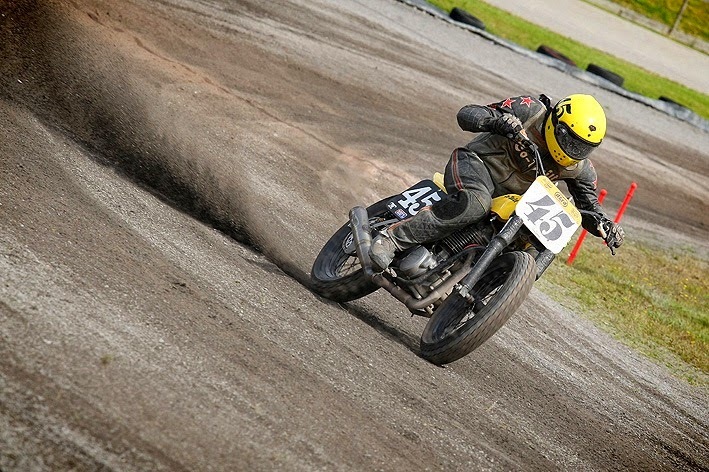 Geoff Co-Built had another good day, coming in second in the Thunderbikes - he's second in the championship - behind Dave Chadbourne, who had an uncharacteristic fifth place finish. I (GI) made the Thunderbike A final despite a few bike problems during the day. Came in 8th in the 12-man final. Could've been worse. Currently fifth in the championship. The Pro Class main was wild. 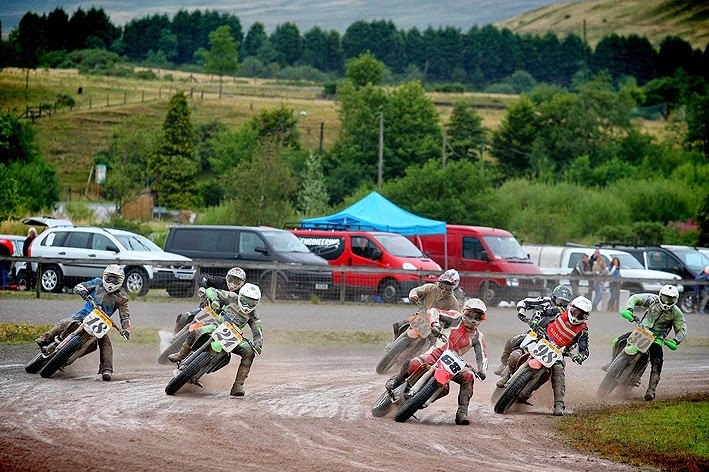 With series leader, Aidan Collins racing in Europe, twin brothers Tom (#68) and Tim Neave (#14) cleared off at the front, with Ollie Brindley (#24) behind them. Tom took the flag, but due to the final being a double points deal (because there were only 11 not 12 riders in the final), his brother took the maximum points. Both Neaves have leapfrogged Collins in the championship, with only one round to go. If Tom Neave comes third in the next race, no matter what Tim and Aidan do, he's won the title. 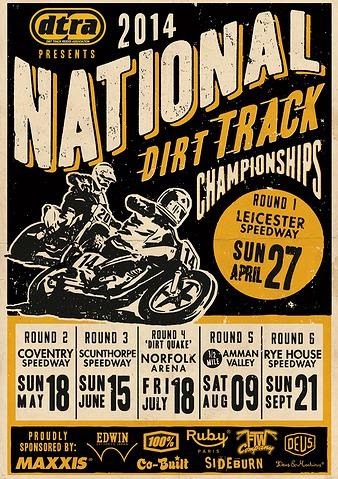 The final round is Rye House, Herts on Sunday 21 September. Spectators go free. Go guto, you old dog!!!. Well done guto. One for the local boys!! A very enjoyable day out in spite of the odd downpour, great racing and good to have a natter in between _ thanks everyone.